The ensign of Edward "Blackbeard" Teach was allegedly a black flag with a white skeleton holding a spear stabbing a heart. However, it must be pointed out there isn't any reliable historical record about Teach actually using it. According to some lecturers, this flag would be merely a modern invention, based on similar flags reportedly flown by Francis Spriggs, Edward Low or Charles Harris. 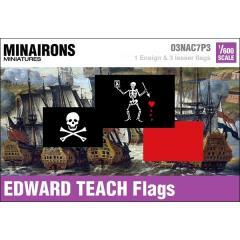 Sizes: ensign W12 x L18 mm, mast flags W8 x L12 mm, jack W6 x L9 mm, pennant W4 x L48 mm.